We’ve all seen it. It’s often an uncomfortable situation. What do we typically do about it? We avoid it. Maybe if we don’t look or focus our attention on it, the problem will go away. Meanwhile, we think to ourselves, “Wow, I’m glad I’m not in their shoes.” What am I talking about? I’m talking about that one student in class who everyone knows never eats lunch, who hopes that no one notices. I’m talking about the family who often moves from place to place, who hopes the new landlord will show them some level of mercy. I’m talking about the mother with a crying child in the check-out line at the grocery store, who after all her items are rung up, realizes she cannot pay for her groceries and needs to have a few items removed from her bill. Meanwhile, we stand by, trying to be polite, doing our best not to make eye contact. Now ask yourself, “What do these social factors have to do with access to health care?” In short, the answer is plenty. Culture (“Social Determinants of Health”, 2018, para 7). Healthy People 2020. (2018). Social Determinants Diagram. Health disparities are experienced by people who are members of marginalized populations and are preventable. These health disparities often align with health inequities. Equality and equity are two tactics that are frequently used when attempting to eliminate health inequities to create a fair or level playing field. These terms are often used interchangeably, but there is a major difference between the two. Equality means everyone is treated the same while equity means treatment is based on what they need to thrive. According to Healthy People 2020, health inequities and health disparities are interchangeable terms that describe inequitable health differences that adversely affect underserved populations. And therefore, understanding the underlying issues that cause the disparities is critical. Take a moment to think about it using the examples given in the introduction. This will help solidify the difference between equality and equity. Our student, who goes through the school day hungry, will have a difficult time focusing in class and on homework. This student is treated the same as his classmates, therefore he/she has equality. But does this student have equity? No, they don’t. While the other students eat lunch, and aren’t hungry throughout the day, our student doesn’t get lunch and is hungry throughout the day. The other students can concentrate and focus in class much better than our student, who most likely is distracted by how hungry he/she is and isn’t able to pay attention. Therefore, our student most likely performs at an unsatisfactory level and has lower grades than the other students. However, if our student was given lunch by the school, regardless of ability to pay, he/she would experience equity and would be at a level playing field with his/her classmates. Makes sense, right? There could be any number of social determinants that could explain why our student doesn’t get to eat lunch. Maybe our student’s family doesn’t have a safe place to live, and they cannot afford to give him money to buy lunch at school. Maybe our student’s parents are unemployed, or have very low-paying jobs, and they don’t have the resources to provide three meals each day. Regardless of the exact social reason, our student is suffering and the lack of eating lunch is affecting his/her performance at school, their overall health and mental status. A recent study by the Los Angeles County Department of Public Health reveals that a population’s health is formed 10% by the physical environment, 20% by clinical care, 30% by health behaviors and 40% by social and economic factors. Figure 2 depicts this research, along with showing what elements help shape those four categories. Is it any surprise that social and economic factors are the leading predictor of health outcomes? County of Los Angeles Public Health. (2013). County Rankings Health Model. Now, keeping our example above in mind, let’s apply the concepts of equality, equity and social determinants to health care. Social determinants of health such as poverty, limited access to health care and lack of education are contributing factors of health inequities. For example, two people visit the same doctor’s office when they are sick. Let’s also assume both individuals are women in their mid-30’s and both have the same symptoms and illness. The first woman, who lives in an affluent neighborhood and has a mid-management level job, is seen by the doctor and is prescribed medication. The second woman, who lives in a marginalized neighborhood and has been out of work for six months, is seen by the same doctor and is prescribed the same medication as the first woman. Excellent, they both were treated equally. The first woman goes to the nearest pharmacy, purchases the medication, takes it as directed and gets better. The second woman received the prescription from the doctor, but she cannot afford it. Therefore, she does not take any medication and she does not get better. Here we have an example of social determinants creating health inequity. The second woman clearly has a variety of socioeconomic issues that influenced her health outcome, even though the physician provided the appropriate level of medical care. An important factor in understanding social determinants to health and how they affect patient outcomes is knowing that something CAN be done! As previously mentioned, health disparities are preventable. We CAN provide high-quality, compassionate and culturally competent health care, regardless of a person’s social and economic status, by addressing social determinants. Community health centers throughout the U.S. exist to serve the uninsured and underinsured. They are community-based and patient-directed organizations that serve populations with limited access to health care. They are strategically located in areas of need, are governed by a community board, provide comprehensive primary care and provide services to all, regardless of their ability to pay. AxessPointe Community Health Centers has been serving the Akron area since 1995. There is a great need throughout Portage and Summit counties, as well as numerous health disparities. It is imperative that AxessPointe and other health centers continue to care for all marginalized populations and provide the best patient experience possible. It is the responsibility of health care leaders to implement policies, procedures and initiatives that mitigate social determinants, create health equity and improve the health of those who entrust their lives to us. Smith, J., Long, A., Shih, M. and Teutsch, S. (2013). 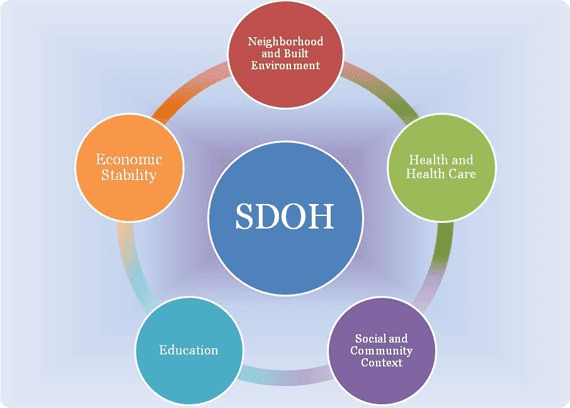 Social Determinants of Health: How Social and Economic Factors Affect Health. [PDF] Los Angeles, p.4. Available at: http://publichealth.lacounty.gov/epi/docs/SocialD_Final_Web.pdf [Accessed 26 Jan. 2018].